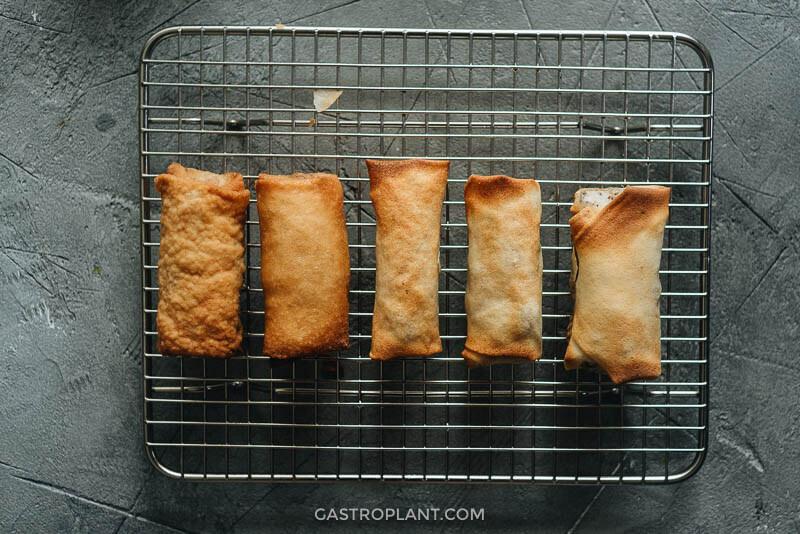 These vegan spring rolls are full of crunchy bamboo shoots, carrots, red cabbage, and tender tofu. They’re much easier to make than your typical Chinese dumpling and they can be baked, deep-fried, or air-fried. They’re also crispy after reheating, which makes them perfect for a party appetizer! 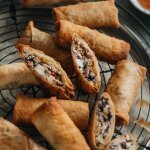 Since spring has just started, I wanted to share these tasty spring vegan spring rolls with you. They’re common in southern China, either as a dim sum item or made by families to celebrate Spring Festival (aka Chinese New Year). The rolls can contain all sorts of fillings, but the signature elements are a crispy wheat-flour-based exterior and a savory filling. I got into this type of spring roll while living in China. There is a prolific dim sum chain called Jin Ding Xuan (Google image link). It has branches all over and many of them are open 24 hours. I’d go there all the time with friends and coworkers. An order of spring rolls there consisted of just a few bites, but super satisfying. They were delicately crispy on the outside with lots of different textures on the inside. We usually needed more than one plate of them. There are countless types of “dumpling” (i.e. dough-filled-foods) in China, but the most common in Beijing, where I was, is a boiled type known as jiaozi. Jiaozi are not easy to wrap. Doing so requires very careful eyeball-measuring of filling, a certain agility to get the folds just right, and enough force to seal in the filling. Even after all these years, my jiaozi wrapping skills are far below average. 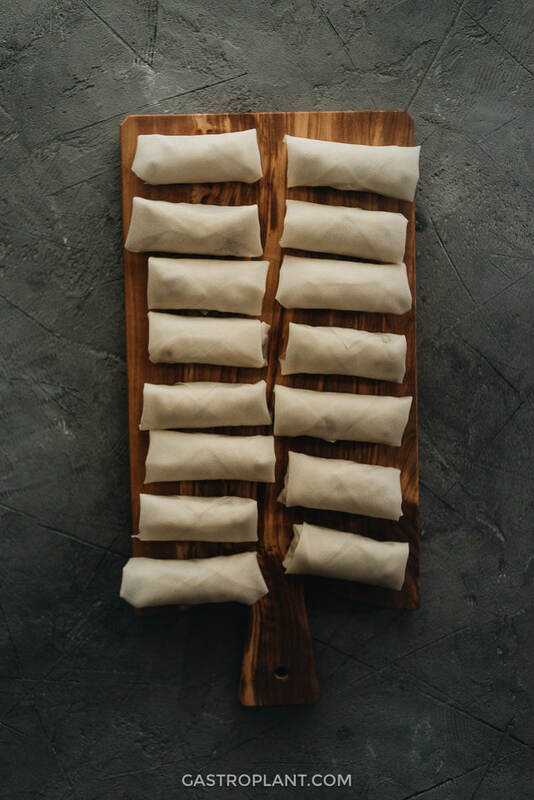 Spring rolls, on the other hand, are very straightforward to wrap and much more forgiving than other types of filled dough. I hadn’t made them before developing this recipe. But of the hundred or so that I ended up making, none of them fell apart while cooking! There are four stages involved in making these: prep, cooking the filling, wrapping the rolls, and cooking the assembled rolls. They’re all quite simple, but it’s important to finish each stage before moving to the next. Prep involves the usual peeling and chopping of raw ingredients. Cooking the filling is a simple saute or stir-fry in a skillet. Wrapping is the most complex, but also the most fun. You can cook the rolls by deep frying, baking in the oven, or in the air-fryer. This stage requires attention more than anything else. 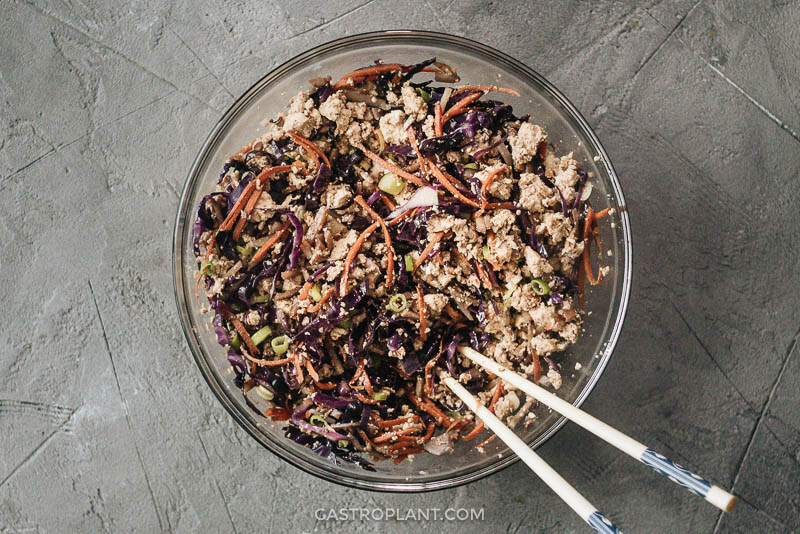 I included bamboo shoots, tofu, red cabbage, and carrot in this recipe, but you can use other ingredients instead (or in addition). Some good alternatives are mushrooms, wood ear mushrooms, tempeh, leeks, kimchi, kale, and daikon radish. If you plan to modify the recipe like this, be sure to keep the total volume of filling the same as prescribed. And, whatever you do, do not forget the ginger, garlic, green onion, and soy sauce! They are critical to a flavorful filling. These are vegan spring rolls? Not egg rolls? And no rice paper? You might be surprised looking at the photos here. You might have expected the other kind of spring roll, the one wrapped in rice paper with raw veggies inside. Those are known as spring rolls, as well, but not the ones we’re making today. Egg rolls are common in overseas Chinese restaurants. They’re similar to these spring rolls, but there are some important differences. 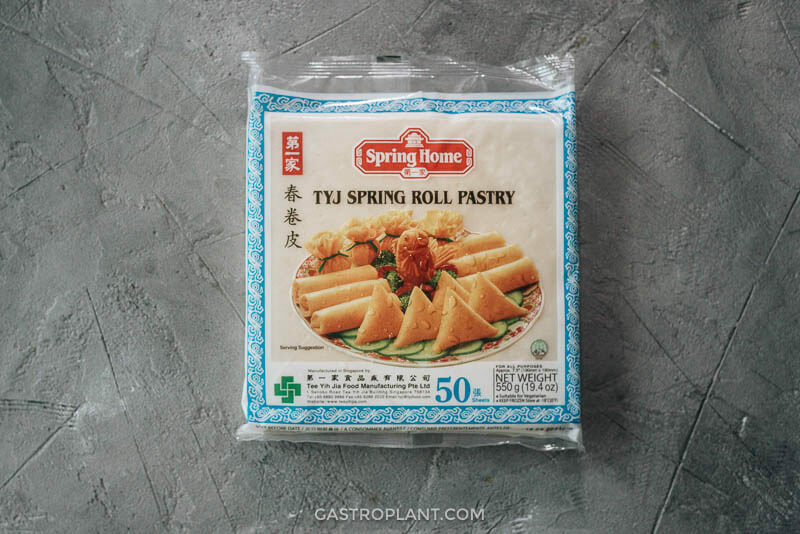 My vegan spring rolls don’t contain any egg (egg rolls sometimes contain egg in the wrapper). And the exterior has a different texture. While egg rolls have a crispy-chewy texture, spring rolls have a crispy-brittle texture. Vegan Hot and Sour Soup – This is one of the most common Chinese dishes, both in China and the rest of the world. And for good reason. The bright flavors and variety of textures make it really satisfying to eat. Buddha’s Delight – This is a classic Buddhist Chinese dish and it is just peaceful and comforting to eat. It’s got all sorts of Asian veggies stir-fried in a savory sauce. 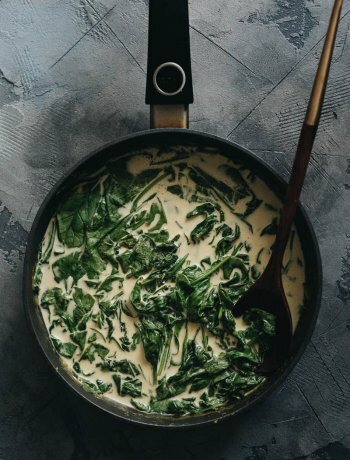 Three-Ingredient Vegan Creamed Spinach – It’s not exactly a Chinese dish, but the flavors will work well with Chinese food. Sauteed green veggies are always present on a Chinese dinner table. You can chop two cloves of garlic and “saute” them in the water (or use a little oil) if you want to enhance the dish a bit (and make it a bit more Chinese). Sweet and Sour Tofu – A less sweet, more flavorful version of the common takeout dish, this one is mildly sweet. The notes that really shine through are the savory vinegar, garlic, and ginger and they make for a refreshing and filling dish. Chinese Mushroom Stir-Fry (coming soon!) – A simple and tasty stir fry of mushrooms, bamboo shoots, and baby bok choy. It’s quick, easy, and nourishing with pleasant aromatics. When wrapping the rolls, keep a damp paper towel over the stack of wrappers to keep them from drying out. And don’t peel a wrapper off the stack before you need it. Also when wrapping, keep a small bowl of water handy. You’ll want to dip your finger in it and coat the closing edge of the wrapper. This will create a seal on the dough so that the filling stays inside. The rolls freeze well, whether cooked or uncooked. But I recommend cooking them immediately after wrapping them to get the best texture and flavor. You can always store and reheat them later. Deep-fry – This is the authentic way and produces delicious, consistent results. It’s also a (relative) pain to set up and clean up. And you have to be careful about getting burned by oil spatter. And carefully monitor the oil temperature to make sure it’s not overheating. If the oil ever starts to smoke, you’ll need to remove the pot from the heat. Depending on the size of your pot, you will be limited to frying 5 or 6 rolls at a time. Bake in the oven – This way is much simpler than deep frying and still produces pretty nice results. It doesn’t require much supervision, but you’ll need to flip the rolls once during baking. Using oil spray will help get a crispy crust and it’ll be less oily than deep-fried. The drawback is that it won’t be quite as consistently crispy. You can bake all the rolls at once, which saves time and effort, as well. 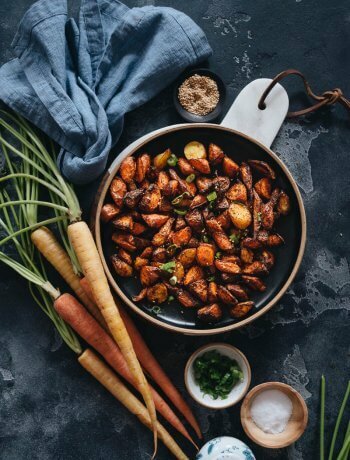 Air-fry – This method combines the best of both methods. The crispiness is more consistent than baking, and you can either skip the oil or spray a thin coating. You’ll be limited in batch size, though, and you’ll need to air-fry 3-5 batches for this recipe. The photo below shows some of the results of deep-frying versus air-frying. I deep-fried the two rolls on the left (the one on the left at a higher temperature). The two in the middle I sprayed with oil and air-fried, and the one on the right I air-fried without oil. If you bake the rolls in the oven, they’ll come out more like those toward the right end of the photo. You can reheat cooked rolls in the oven – preheat the oven to 350F and reheat them on a baking sheet for 8-12 minutes until crispy. If reheating in the air-fryer, preheat to 300F and air-fry for 10-12 minutes until crispy. 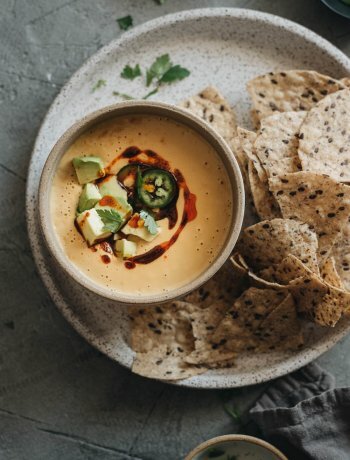 I’ve included a dipping sauce that is nutty, tangy, and slightly spicy. It goes great with the spring rolls, but feel free to skip it or use other sauces if you like. 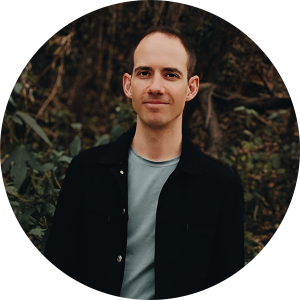 As always, let me know if you have any feedback or questions in the comments below. Heat 2 Tablespoons peanut oil in a large skillet over medium heat. When the pan and oil are hot, add the ginger and garlic. Stir for about 1 minute until fragrant. Add the carrot. Continue to stir for 2 minutes. Add the bamboo, cabbage, cumin, chile powder, and 1 Tablespoon of soy sauce. Continue to stir and cook for 2 minutes. Transfer contents of skillet to a large mixing bowl. Wipe skillet clean with a paper towel and return it to the stove. Heat the remaining 2 Tablespoons of peanut oil over medium heat until hot. Add the tofu into the skillet. Use a spatula to break it apart into small crumbles. Stir and cook for 1 minute once the tofu is thoroughly broken up. Add the remaining 2 Tablespoons of soy sauce and the maple syrup. Stir well and cover the skillet. Cook for 2 more minutes, then transfer the tofu to a plate to cool. After the tofu has cooled for 5 minutes, add it, along with the green onion, to the bowl and stir everything together well. Prepare the wrapping station: Add some water to a small bowl. Place the spring roll wrappers on a plate along with a spoon and the filling. 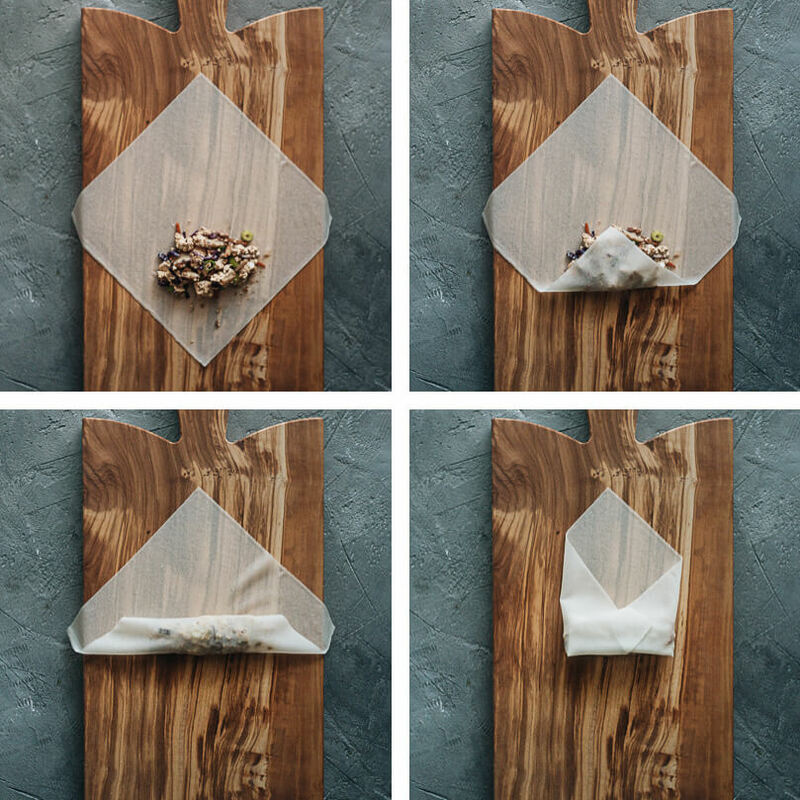 Prepare a large plate or tray to hold the wrapped rolls and a cutting board for wrapping them. 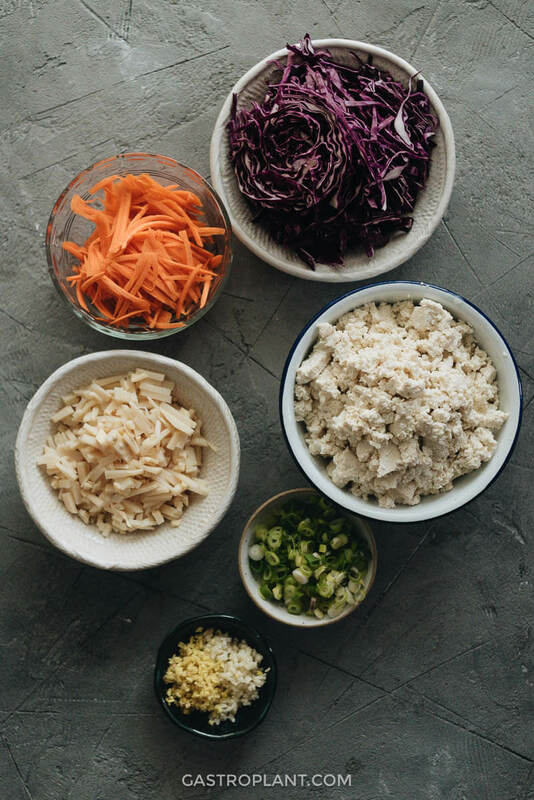 To wrap a spring roll, gently remove one wrapper from the stack using both hands and place it on the cutting board, with a corner pointing toward you. Add 2 to 3 tablespoons of filling onto the lower end of the wrapper, making a 4-inch (10-cm) wide, tight and even mound. Tightly roll from the bottom corner toward the top, until about halfway up. Tightly fold the left and right corners of the wrapper towards the center, so it looks like an opened envelope. Dip your finger into the water and brush the top corner of the wrapper. Tightly roll the spring roll upward until it’s completely sealed. Repeat the process, until you’ve used all the filling. 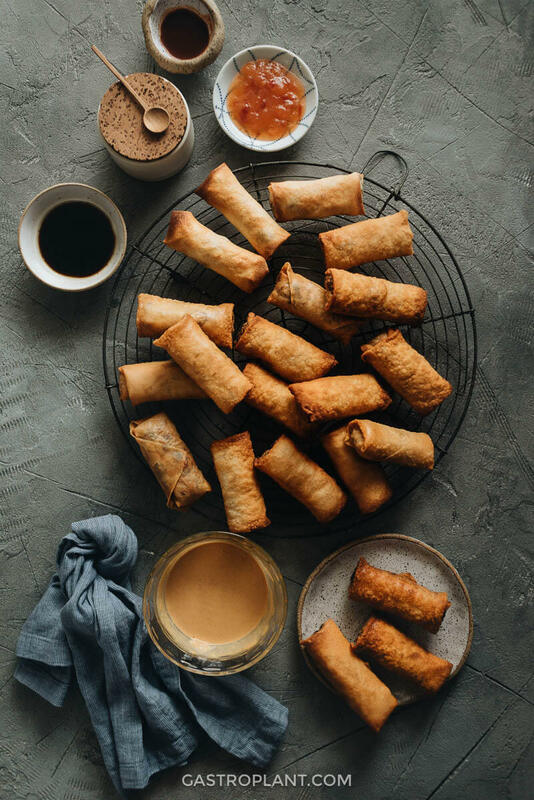 Although you can freeze the spring rolls at this stage, I prefer to cook them all at once and store the cooked ones so I only need to do one deep-frying session. 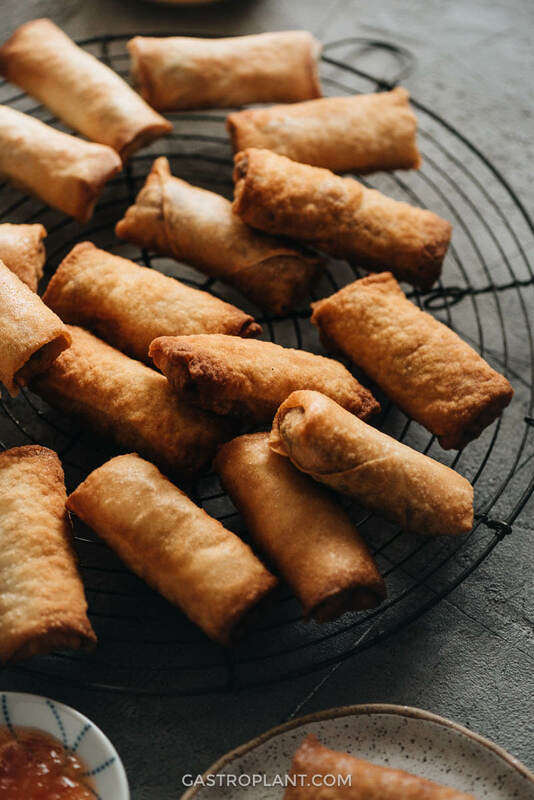 On the other hand, if you want to make the spring rolls in advance and serve them fresh at your party, you can freeze them without cooking them. To do so, place the spring rolls on a baking sheet with gaps in between. Wrap them tightly with plastic wrap and store them in the freezer until ready to cook. You can fry them straight out of the freezer, but remember to add 1 minute of frying time. 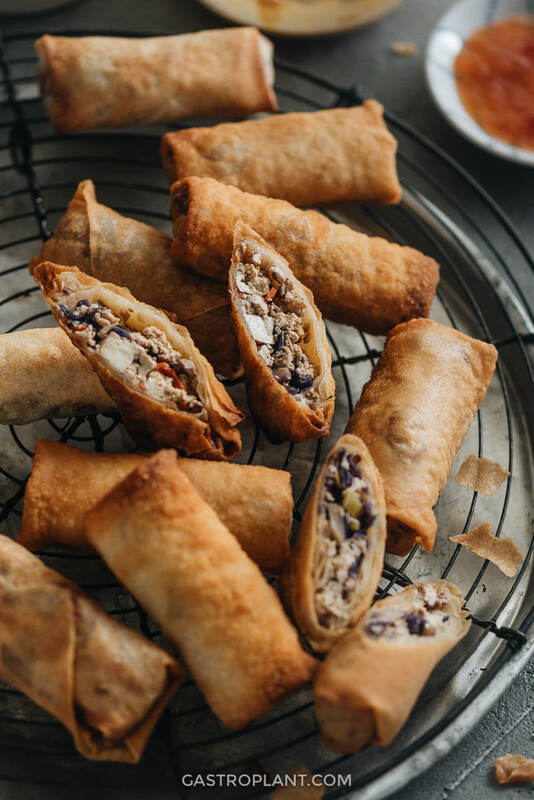 Prepare a baking sheet with a rack on top, for cooling the spring rolls. Option 1 - To deep fry the spring rolls, heat 1 inch (2.5 cm) of oil in a deep medium pot or a dutch oven over medium heat to 350 F (177 C). If you do not have a thermometer, insert a wooden chopstick into the heated oil. You should see continuous tiny bubbles coming up around the chopstick. If the bubbles only come up here and there, the oil is not hot enough. If the bubbles are large and bursting to the surface, the oil is too hot. Fry the spring rolls in batches of 5 to 6. Flip and move them occasionally for even browning. Fry until the spring rolls are golden, 5 to 6 minutes. Drain and transfer the spring rolls with a slotted spoon or wire spider onto the rack to let them cool. Repeat until you have cooked all the spring rolls. Option 2 - To bake the spring rolls in the oven, preheat the oven to 400 degrees F (200 C). Place the spring rolls onto a lined baking sheet, seam-side-down, with about 2 fingers’ width gap between. Generously spray oil on top. Bake for 9 minutes, or until the bottom turns a golden color. Flip the spring rolls and spray oil onto them again. Return the tray to the oven. Bake for another 6 to 8 minutes, until the other side is golden as well. Once done, let the spring rolls cool on a wire rack for 10 minutes before serving to maximize crispiness. Option 3 - To fry the spring rolls in an air-fryer, preheat the air-fryer to 390 F (10 mins or so). Cook them in batches. Spread a few spring rolls in the basket without overlapping them. Spray with a thin layer of oil, or you can cook them without oil. Air-fry for 6 minutes, flip, and air-fry for another 5 minutes. Once done, let the spring rolls cool on a wire rack for 10 minutes before serving to maximize crispiness. Combine all the ingredients for the dipping sauce in a bowl until smooth. You may need two batches of sauce, depending on your usage. Serve the spring rolls hot with the included dipping sauce or whatever sauce(s) you prefer. You can substitute other vegetables in the filling, but be sure to keep the total volume of veggies the same as given here. See the blog post for suggestions. See the photo in the blog post for an idea of how to roll the spring rolls. You can freeze the wrapped, uncooked rolls if you like, and fry them straight out of the freezer. Just cook them for a minute or so longer than prescribed here. Feel free to use any dipping sauce you like, or skip the dipping sauce altogether. I’m obsessed with spring rolls.